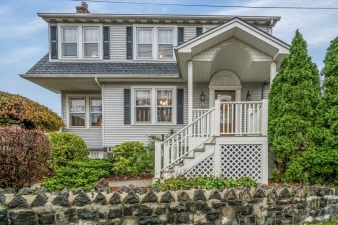 Beautiful Dutch Colonial in sought after neighborhood of Cliffside Park. This house boasts a bright and open floor plan with gleaming hardwood floors and skylights throughout. Enter through the front porch into a spacious living room with wood burning stove that leads to a formal dining room, a powder room and a beautiful chef's kitchen with center island, cathedral ceiling, oak cabinets and a sliding glass door to a charming porch. Second level features a large master bedroom and 2 additional good sized bedrooms. Main full bath has whirlpool tub, separate shower and cathedral ceiling. Finished basement has tile flooring, laundry area, full bath, and plenty of storage. 2-car detached garage with driveway. This home is impeccable!